LOT OF LUXE If they build it, the tourists will come. Plans for a chic hotel at The Barlow appear to have hit an obstacle while plans for another tony hotel nearby are moving forward as Sebastopol tries to ramp its tourist-tempting profile as the so-called "Gateway to Bodega." 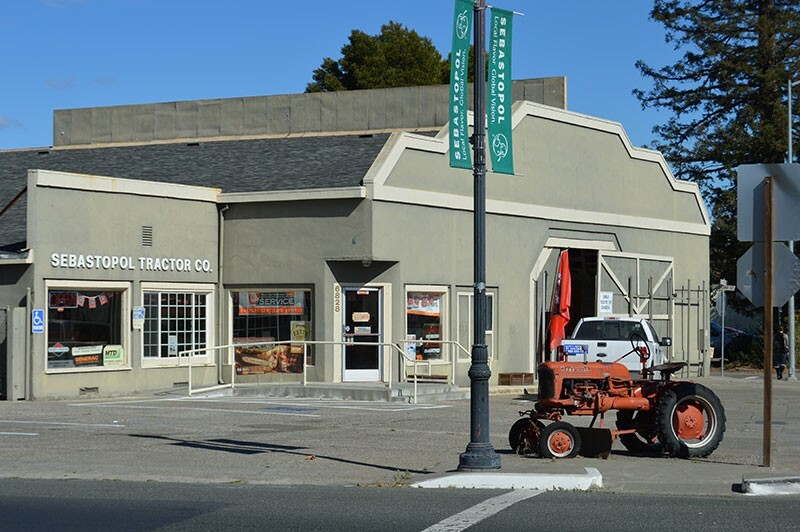 The Hotel Healdsburg's Piazza Hospitality Group is moving ahead with plans for a hotel on the site of the Sebastopol Tractor Co., designed by San Francisco architect David Baker. The Bohemian reported earlier this year on the plans, then in their pre-infancy. At the time, The Barlow hotel proposal had already started to gain steam. The Piazza planners had a public meeting to take input from residents in September and plan to have another next month. Developer Ronald Basso owns the lot and it's for sale at $3 million, according to the building's current tenant. Basso told the Bohemian back in January that he wanted to redevelop the site, but couldn't then say whether a hotel was the preferred option. Ten months later, a hotel appears to be the preferred option. Piazza group sales and marketing executive Circe Sher says her company is working quickly to secure support for the hotel from Sebastopol residents and officials. The plan is not locked in, she says, but her company is "very interested in this location." Time is of the essence, Sher says. "We need to go hard on the project by next March. That's when we have to make a firm deposit on the property. By then we'd want to know if we are moving forward on the project." The proposal has yet to be put before the Sebastopol City Council or planning commission, and a councilman gives the Piazza people credit for taking the temperature of Sebastopol residents and incorporating their suggestions into the proposed design before coming before the city. That effort will go a long way when the proposal comes before the Sebastopol City Council for review. "It increases the likelihood that the public is going to support the project," says councilman and former Sebastopol Mayor Robert Jacob, "and with public support, that's a great advantage." Meanwhile, over at The Barlow, plans for a hotel were nixed over concerns that it would be constructed on a floodplain, a zoning no-no. The plan called for tearing down the warehouse-like Guayaki yerba mate building and replacing it with a hotel. In that scenario, the Guayaki business would be relocated. A Press Democrat story from early August asserted that the plan was moving ahead despite the zoning snafu, and notes that Barlow owner Barney Aldridge, who did not respond to requests for comment on this story, was working to find a new home for Guayaki. Aldridge told the PD back then that he'd be submitting a new plan to the city within two weeks. Two months later: no plan. "There's no item before the city council, and the planning commission hasn't even discussed it," says Jacob. For that reason, Jacob's uncertain about whether the revised Barlow plan will happen at all on that site. "I believe the hotel at The Barlow is not happening," Jacob says. The councilman is certain that downtown is ready and in need of a hotel, maybe more than one. Sebastopol, he says, is a hospitable place that lacks for sufficient hospitality services. There are just two motels in town, the Sebastopol Inn and the Fairfield Inn and Suites. "For us to have the opportunity for a non-chain, non-formula hotel with a proven track record, to be proposing opening a hotel in our downtown corridor, is a blessing for us," Jacob says, referring to the Piazza Group, which operates the h2 and Hotel Healdsburg in Healdsburg. Chris Mann is chairman of the board at Guayaki and says Aldridge is proceeding with his plan to build a hotel at the business's current site. His operation is looking for a new home, hopefully in Sebastopol. Mann says he's surprised that Aldridge hasn't yet approached the city with his revised plan, but notes that "it's a complicated and expensive process, and there's lots of new development already going on at The Barlow." Of the two hotels currently in the offing, he adds that downtown needs all the rooms it can get, and that a green-light on one hotel doesn't necessarily rule out the other. Both plans ought to be supported as they move forward, he adds, given that "neither is a slam dunk." The backdrop here is the changing economic landscape of Sebastopol. In short, the apples are gone and tourism is the new core economy, along with cannabis and parking tickets. Sher says that the idea is to build a hotel that reflects the town's agricultural history. That translates into lots of open green space and other natural stuff. Sher was also curious about the goings-on at The Barlow. As well she should be, given that the prospect of two boutique hotels in near-proximity to one another may jump the swank shark, even in a town that's supportive of increased hospitality services. Indeed, Sher notes that the Piazza plan originated in part from a recent Sebastopol civic push to "bring visitors to town and have a connection between The Barlow and downtown—that's what we are going off of."